Manuela Mischke-Reeds, MA, LMFT, is a licensed somatic psychotherapist, international teacher and speaker, author and meditation teacher. She co-directs and teaches at the Hakomi Institute of California and is the developer of “From Trauma to Dharma”, a somatic trauma training for professionals. Manuela is the author of 8 Keys to Practicing Mindfulness (W.W. Norton, 2015) and was a contributor to Hakomi Mindfulness-Centered Somatic Psychotherapy. Manuela brings together 25 years of in-depth clinical practice and teaching in somatic trauma therapies, Hakomi psychotherapy, attachment and infant mental health work, Buddhist meditation practices and movement therapies. Her approach to working with trauma is an inside out approach that utilizes the depth of the body’s knowledge. Her unique teaching gift is inspiring how we live our lives from the reverence and awareness of interconnection. "There are so many options in this boo on how to work with a presenting issue, so it really helps me in finding the most suitable intervention for any particular client. The different option are also well described, so it's easy to understand when to use what. I also find the way the tools are categorized really helpful. They are easy to find, just like in a great toolshed. The worksheets can be downloaded and printed, which is really useful when I work with clients online, but also for clients who would like to track their experiences at home. This is a great book to have handy, not only for client interventions, but also to look up helpful exercises to ground and nourish my own body and mind. I highly recommend it!" "This is a must-read for every clinician out there. This book reminds us just how much of our experience happens in the body and just how unattended the body can be. 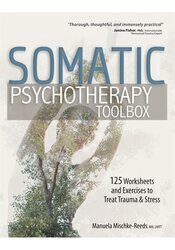 It is a wonderfully clear, concise and comprehensive guide to using somatic techniques in therapy that can equally benefit a seasoned or a novice clinician. The author shares her tremendously rich experience by offering very practical and concrete ways of how to guide our clients into their own body, help them become aware of inner processes, and how to make this experience safe and meaningful."